Whenever someone discovers something that contradicts established academia, their findings are suppressed. This is true in economics, earth sciences, and even archaeology. Heinrich Schliemann discovered Troy and most of the ancient cities because he believed that Homer was history when academics declared it a story for children without proving that conclusion. There are countless objects in museums that remain in hidden drawers because they contradict the established linear timeline of history. Those who have tried to expose this were blacklisted. NBC even broadcast a show on “The Mysterious Origins of Man” that raised a lot of controversy and complaints from academics. Then there was a book known as “Historia Augusta”. The academics declared it a fraud written by a monk around 600 AD because it listed a number of Roman emperors during the crash of the 3rd century that they had never heard of. 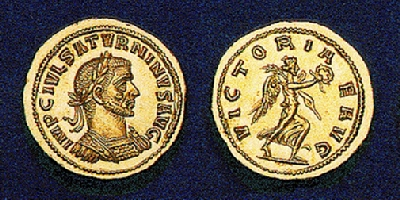 Then two coins were discovered in Egypt of Saturninus who happened to be one of these names mentioned in “Historia Augusta”. Once again, this coin (one in our collection, the other in the Louve) established the authenticity of “Historia Augusta” against the academics. The point is rather simple. The majority of the establishment in academics ALWAYS rejects anything that contradicts their theories. Change must always come from the outside in, and never from the inside out.